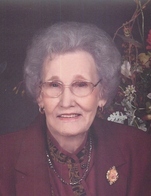 Calhoun City--- Lillian Farris Spencer died August 17, 2018 at Baptist Nursing Home in Calhoun City, MS.
Born to Elisha W. and Viola McLemore Farris December 12, 1923 in Rienzi, MS. She lived most of her life in Calhoun County. She was a member of First Baptist Church in Calhoun City. Lillian was a beloved mother, grandmother, great-grandmother, great-great grandmother, sister, aunt, and friend. Survived by her daughter, Mildred (Wayne) Crocker of Calhoun City; a son, George R. (Inja) Spencer of Memphis, TN. Grandchildren, Amanda (Randy) Tutor, Selena (David) Magness of Hernando, MS, Allison (Scott) Enochs of Calhoun City, George R. Spencer, Jr (Jill) of Memphis, TN, Greg (Lydia) Spencer of Millington, TN, Gwen Spencer of Los Angeles, CA. ; great-grandchildren, Kayla Tutor of Pontotoc, Cole (Laken) Tutor of Pontotoc, MS., Kristina (Bradley) Sanders of Jonesboro, AR., Evan Enochs of Jackson, MS, Drew Enochs of Calhoun City, Ryan (Laura) Magness of Hernando, MS, Lily Spencer and Annie Spencer of Millington, TN and Nicole Spencer of Memphis, TN, and a brother, Homer Farris of Petal, MS.
She was preceded in death by her husband, Oren Spencer, one sister, Naomi Reeves, her brothers, Alfred, James, Wilborn, J.D., and Harry Farris. A Funeral service will be Monday, August 20 at 2:00pm at Pryor Funeral Home. Visitation will be Monday noon until service time also at the funeral home. Interment will be at Pinecrest Memorial Gardens in Calhoun City. Pallbearers will be grandsons and great-grandsons, Ryan Magness, Evan Enochs, Drew Enochs, George Jr., Spencer, Greg Spencer, and Cole Tutor. Memorials may be made to First Baptist Church, P.O. Box 94, Calhoun City, MS, 38916. To send flowers to the family of Lillian Spencer (Farris), please visit our Heartfelt Sympathies Store.